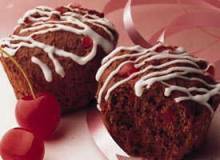 Two of your favorite things--bread and chocolate--in this yummy cherry chocolate bun. 2. Grease 18 medium muffin cups, 2 1/2x1 1/4 inches. Stir down batter by beating 25 strokes. Fill muffin cups 1/2 full. Cover and let rise in warm place about 40 minutes or until double. 3. Heat oven to 375ºF. Bake about 15 minutes. Immediately remove from pan to wire rack. Drizzle Easy Vanilla Glaze, made with almond extract, over warm buns. Look for maraschino cherries with or without stems. Use any remaining cherries as a garnish for these buns or other sweet treats and cocktails. This was the most delicous thing in the world! I think everyone should try this and it should be sold in local bakeries of every town!! I picked this one for the greatest bun !it tasted great & looked great many of my friends liked it! I love this thing It tastes unbelievable & many people liked it when i made it ! MY FRIEND, Melani ! visited this site to searrch for more delicious buns & cakes!